Tidal power, sometimes called tidal energy, is a form of hydropower that exploits the rise and fall in sea levels due to the tides, or the movement of water caused by the tidal flow. Because the tidal forces are caused by interaction between the gravity of the Earth, Moon, and Sun, tidal power is essentially inexhaustible and classified as a renewable energy source. In fact though, the ultimate energy source is the rotational energy of the Earth, which will not run out in the next four billion years, although the Earth's oceans may boil away in two billion years. Although not yet widely used, tidal power has great potential for future electricity generation and is more predictable than wind energy and solar power. In Europe, tide mills have been used for nearly a thousand years, mainly for grinding grains. Tidal stream systems make use of the kinetic energy from the moving water currents to power turbines, in a similar way to underwater wind turbines. This method is gaining in popularity because of the lower ecological impact compared to the second type of system, the barrage. Barrages make use of the potential energy from the difference in height (or head) between high and low tides, and their use is better established. These suffer from the dual problems of very high civil infrastructure costs and environmental issues. Modern advances in turbine technology may eventually see large amounts of power generated from the oceans using the tidal stream designs. Arrayed in high velocity areas where natural flows are concentrated, such as the west coast of Canada, the Strait of Gibraltar, the Bosporus, and numerous sites in south east Asia and Australia. Such flows occur almost anywhere where there are entrances to bays and rivers, or between land masses where water currents are concentrated. A factor in human settlement geography is water. Human settlements have often started around bays, rivers, and lakes. Future settlement may be concentrated around moving water, allowing communities to power themselves with non-polluting energy from moving water. 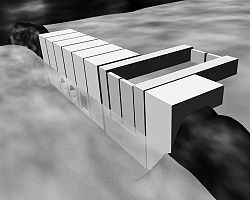 An artistic impression of a tidal barrage, including embankments, a ship lock and caissons housing a sluice and two turbines. The basic elements of a barrage are caissons, embankments, sluices, turbines, and ship locks. Sluices, turbines, and ship locks are housed in caisson (very large concrete blocks). Embankments seal a basin where it is not sealed by caissons. The sluice gates applicable to tidal power are the flap gate, vertical rising gate, radial gate and rising sector. Barrage systems are sometimes affected by problems of high civil infrastructure costs associated with what is in effect a dam being placed across two estuarine systems, and the environmental problems associated with changing a large ecosystem. The basin is filled through the sluices until high tide. Then the sluice gates are closed. (At this stage, there may be "Pumping" to raise the level further.) The turbine gates are kept closed until the sea level falls to create sufficient head across the barrage, and then are opened so that the turbines generate until the head is again low. Then the sluices are opened, turbines disconnected and the basin is filled again. The cycle repeats itself. Ebb generation (also known as outflow generation) takes its name because generation occurs as the tide ebbs. The basin is filled through the turbines, which generate at tide flood. This is generally much less efficient than ebb generation, because the volume contained in the upper half of the basin (which is where ebb generation operates) is greater than the volume of the lower half (and making the difference in levels between the basin side and the sea side of the barrage), less than it would otherwise be. This is not a problem with the "lagoon" model; the reason being that there is no current from a river to slow the flooding current from the sea. Turbines are able to be powered in reverse by excess energy in the grid to increase the water level in the basin at high tide (for ebb generation). This energy is more than returned during generation, because power output is strongly related to the head. With two basins, one is filled at high tide and the other is emptied at low tide. Turbines are placed between the basins. Two-basin schemes offer advantages over normal schemes in that generation time can be adjusted with high flexibility and it is also possible to generate almost continuously. In normal estuarine situations, however, two-basin schemes are very expensive to construct due to the cost of the extra length of barrage. There are some favorable geographies, however, which are well suited to this type of scheme. The placement of a barrage into an estuary has a considerable effect on the water inside the basin and on the fish. A tidal current turbine will have a much lower impact. Turbidity (the amount of matter in suspension in the water) decreases as a result of smaller volume of water being exchanged between the basin and the sea. This lets light from the Sun to penetrate the water further, improving conditions for the phytoplankton. The changes propagate up the food chain, causing a general change in the ecosystem. As a result of less water exchange with the sea, the average salinity inside the basin decreases, also affecting the ecosystem. "Tidal Lagoons" do not suffer from this problem. Estuaries often have high volume of sediments moving through them, from the rivers to the sea. The introduction of a barrage into an estuary may result in sediment accumulation within the barrage, affecting the ecosystem and also the operation of the barrage. Again, as a result of reduced volume, the pollutants accumulating in the basin may be less efficiently dispersed, so their concentrations may increase. For biodegradable pollutants, such as sewage, an increase in concentration is likely to lead to increased bacteria growth in the basin, having impacts on the health of the human community and the ecosystem. Fish may move through sluices safely, but when these are closed, fish will seek out turbines and attempt to swim through them. Also, some fish will be unable to escape the water speed near a turbine and will be sucked through. Even with the most fish-friendly turbine design, fish mortality per pass is approximately 15 percent (from pressure drop, contact with blades, cavitation, and so forth.). This can be acceptable for a spawning run, but is devastating for local fish who pass in and out of the basin on a daily basis. Alternative passage technologies (fish ladders, fish lifts, and so forth) have so far failed to solve this problem for tidal barrages, either offering extremely expensive solutions, or ones which are used by a small fraction of fish only. Research in sonic guidance of fish is ongoing. A relatively new technology tidal stream generators draw energy from currents in much the same way as wind turbines. The higher density of water, some 832 times the density of air, means that a single generator can provide significant power. The Bay of Fundy in Canada. Several commercial prototypes have shown promise. Trials in the Strait of Messina, Italy, shave been carried out successfully, and an Australian company, Tidal energy, undertook successful commercial trials of highly efficient shrouded turbines on the Gold Coast, Queensland, in 2002, that was followed by successful joint venture commercial trials by Canada by Quantum Hydro Power in 2005-2006, using the Gorlov Helical Turbine on the Canadian West Coast where water speeds have been measured up to 16 knots. 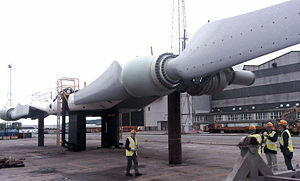 During 2003, a 300 kW Periodflow marine current propeller type turbine was tested off the coast of Devon, England, and a 150 kW oscillating hydroplane device, the Stingray, was tested off the Scottish coast. Relative to an open turbine in free stream where typical turbine efficiency has been measured at around 22 percent. Shrouded turbines are capable of higher efficiencies as much as 4 times the power of the same turbine in open flow. A shroud or duct that houses the turbine and can produce up to four times the energy output of the same turbine for little extra project cost has been proven by prototype tests in Australia in 2002 and 2005. Considered to be the next generation of water turbines, they are an advancement over technology that has been relatively stagnant since the middle ages when the windmill was invented. Shrouded turbines can produce the same energy from a much smaller turbine while larger turbines if housed in a shroud have significant attraction to commerce where "Rate Of Return" on investment may be up to fifteen years on some sites where open turbines are used. Commercial trials undertaken on shrouded turbines in 2006, along the Canadian west coast will eventually see mass production and roll out over multiple sites where there are some of the fastest flows ever recorded of up to 16 knots, or about 8.5 m/s. A one meter (m) square open turbine in this flow could produce around 0.5 megawatt (MW), while a shrouded turbine nearly 2 MW. Average flows are somewhat less around 6 to 10 knots or about 3-5 m/s. Tidal power schemes do not produce energy all day. A conventional design, in any mode of operation, would produce power for 6 to 12 hours in every 24 and will not produce power at other times. As the tidal cycle is based on the rotation of the Earth with respect to the moon (24.8 hours), and the demand for electricity is based on the period of rotation of the earth (24 hours), the energy production cycle will not always be in phase with the demand cycle. However, the tides are relatively reliable and more predictable than other alternative energy sources, such as wind. In mathematical modeling of a scheme design, the basin is broken into segments, each maintaining its own set of variables. Time is advanced in steps. Every step, neighboring segments influence each other and variables are updated. The simplest type of model is the flat estuary model, in which the whole basin is represented by one segment. The surface of the basin is assumed to be flat, hence the name. This model gives rough results and is used to compare many designs at the start of the design process. In these models, the basin is broken into large segments (1D), squares (2D), or cubes (3D). The complexity and accuracy increases with dimension. Tidal energy has an efficiency of 80 percent in converting the potential energy of the water into electricity. It is thus very efficient, compared to other energy resources such as solar power or fossil fuel power plants. A tidal power scheme is a long-term source of electricity. A proposal for the Severn Barrage, if built, has been projected to save 18 million tons of coal per year of operation. This decreases the output of greenhouse gases into the atmosphere. If fossil fuel resource is likely to decline during the twenty-first century, as predicted by Hubbert peak theory, tidal power is one of the alternative source of energy that will need to be developed to satisfy the human demand for energy. There are several operating tidal power systems around the world. The following are some examples. The first tidal power station was the Rance tidal power plant built over a period of 6 years from 1960 to 1966, at La Rance, France. It has 240MW installed capacity. The first tidal power site in North America is the Annapolis Royal Generating Station, Annapolis Royal, Nova Scotia, which opened in 1984, on an inlet of the Bay of Fundy. It has 20MW installed capacity. A small project was built by the Soviet Union at Kislaya Guba on the Barents Sea. It has 0.5MW installed capacity. China has apparently developed several small tidal power projects and one large facility in Jiangxia. China is also developing a tidal lagoon near the mouth of the Yalu. South African energy parastatal Eskom is investigating using the Mozambique Current to generate power off the coast of KwaZulu Natal. Because the continental shelf is near to land it may be possible to generate electricity by tapping into the fast flowing Mozambique current. A 1.2 MW SeaGen system was installed in Strangford Lough in Northern Ireland and became operational in 2008, generating 1.2MW of power. The largest tidal energy project entitled MeyGen (398MW) was installed in the Pentland Firth in northern Scotland in 2016. ↑ SeaPower scrl, KOBOLD: Vertical Axis Marine Turbine. Retrieved February 2, 2017. ↑ Tidal energy system on full power BBC News, December 18, 2008. Retrieved February 2, 2017. ↑ Mure Dickie, Scotland unveils world’s largest tidal stream power project Financial Times, September 12, 2016. Retrieved February 2, 2017. Baker, G.C., E.M. Wilson, H. Miller, R.A. Gibson, and M. Ball. The Annapolis tidal power pilot project. In Waterpower `79 Proceedings, ed. Anon. Washington: U.S. Government Printing Office, 1980. Hammons, T.J. "Tidal power." Proceedings of the IEEE, 81(3) (1993): 419-433. Retrieved February 6, 2017. Lecomber, R. "The evaluation of tidal power projects." In Tidal Power and Estuary Management. Eds. R.T. Severn, D.L. Dineley, & L.E. Hawker. Dorchester: Henry Ling Ltd, 1979. Location of Potential Tidal Stream Power sites in the UK. University of Strathclyde ESRU—Summary of tidal and marine current generators. University of Strathclyde ESRU—Detailed analysis of marine energy resource, current energy capture technology appraisal and environmental impact outline. Renewable Energy UK Tidal—Articles about tidal power generation. U.S. Patent 6982498 (PDF), Tharp, January 3, 2006, Hydro-electric farms. U.S. Patent 6995479 (PDF), Tharp, February 7, 2006, Hydro-electric farms. U.S. Patent 6998730 (PDF), Tharp, February 14, 2006, Hydro-electric farms. This page was last modified on 6 February 2017, at 16:00.